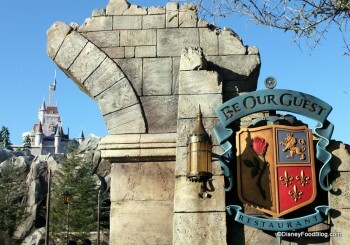 Be Our Guest Restaurant is part of the Magic Kingdom’s Fantasyland expansion. 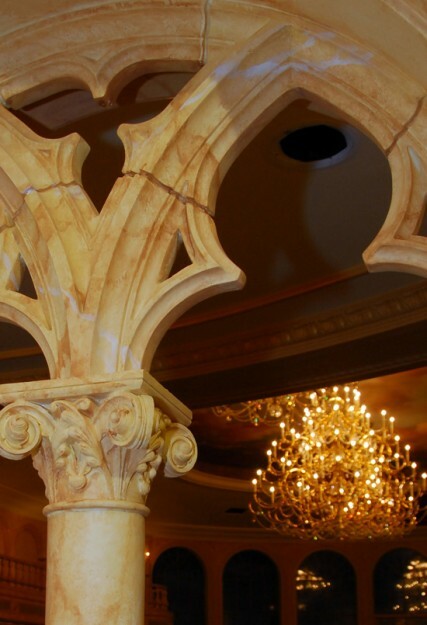 See our Be Our Guest Restaurant “EVERYTHING ON THE MENU! Review” here! 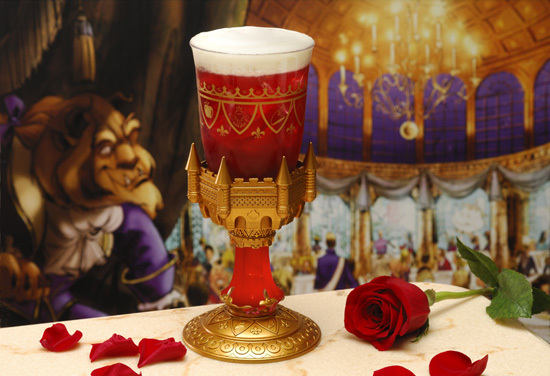 Be Our Guest Restaurant serves Beer and Wine — it was the first restaurant to do so in the Magic Kingdom. Also see our latest review for the updated Prix Fixe, Signature Dinner here. (This new serving style was introduced in July 2018). 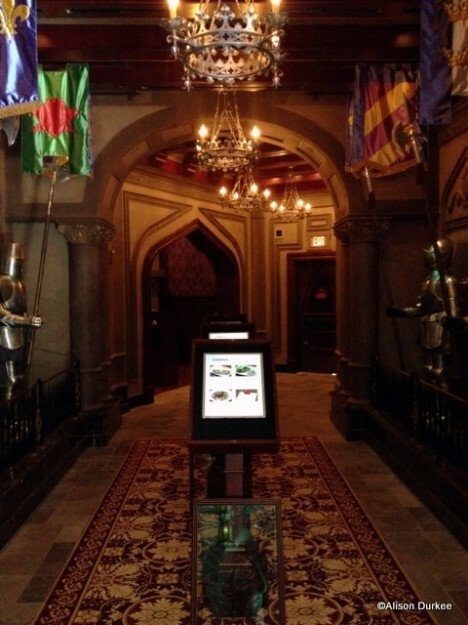 and a Be Our Guest Restaurant Video Tour! Be Our Guest Restaurant has enchanted us since we first glimpsed the concept art and heard from the Imagineers in these videos. Counter-Service (fast-casual) for breakfast and lunch, then Table Service (sit down) for dinner. Breakfast and lunch are unique at Be Our Guest Restaurant in that guests can make Advanced Dining Reservations for this Counter Service experience (and it is advised to do so, as these experiences remain incredibly popular). And for lunch, guests can pre-order their meals using “My Disney Experience” within 30 days of their dining date. For those who choose not to pre-order their lunch, touch-screen, automated terminals are available for guests to customize their orders. For special dietary requests and cash orders, cashiers are also available. Once your order is placed (either online or via the My Disney Experience app in advance or at the restaurant), you’ll sit down and your order will be delivered to you on real tableware — no paper and plastic around here. 😉 Guests who have eaten at Wolfgang Puck Express in Downtown Disney will understand the process here. At dinner, guests will be seated and served as in other Disney table-service restaurants. Keep reading to find out about the lovely dining rooms you’ll be dining in! The restaurant seats 546 total. Tables in Wonderland: Yes, dinner only. Counter-Service Breakfast Menu: Meals for breakfast are prix fixe and include choice of entree, beverage, and an assortment of pastries to share at the table. Adult entrees feature an Open-face Bacon and Egg Sandwich, Eggs Florentine, French Croissant Doughnut, Assorted Cured Meats and Cheese Tray, Scrambled Egg Whites, and Vegetable Quiche. Kids meals feature choices such as Crepes and French Toast. Counter-Service Lunch Menu: Sandwiches and salads on the menu include a tuna Niçoise salad and a Croque Monsieur sandwich with carved ham, Gruyere cheese, béchamel, and pommes frites, plus Carved turkey on a warm baguette with Dijon mayonnaise, or a Carved Prime Chuck Roast Beef Sandwich. These are also served with pommes frites. A braised pork dish — this is the Chef’s favorite. Vegetarians will enjoy a loaded vegetable quiche or quinoa salad. For the kiddos at lunch, expect a carved turkey sandwich, slow cooked pork, Mickey meatloaf, seared mahi mahi, or whole-grain macaroni topped with marinara and mozzarella. Table-Service Dinner: Meals for dinner as of July 27, 2018 are prix fixe and include choice of appetizer and entree, along with a Dessert Trio. Appetizer selections include French Onion Soup, Charred Octopus, Escargot, and assorted meats and artisanal cheeses. Adult entrees will feature Center-Cut Filet Mignon. Poulet Rouge Chicken, Saffron-Infused Seafood Bouillabaisse, Roasted Lamb Chops and Pork Tenderloins. 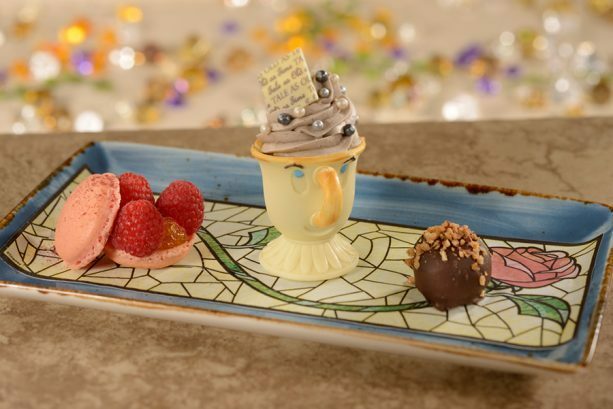 The Dessert Trio is presented on a personal platter and includes a raspberry macaron, a dark chocolate truffle, and a white chocolate cup (Chip!) filled with The Grey Stuff. The new dinner experience requires two table-service credits on the Disney Dining Plan, or an out-of-pocket $60.00 per adult and $36.00 per child ages 3 to 9. 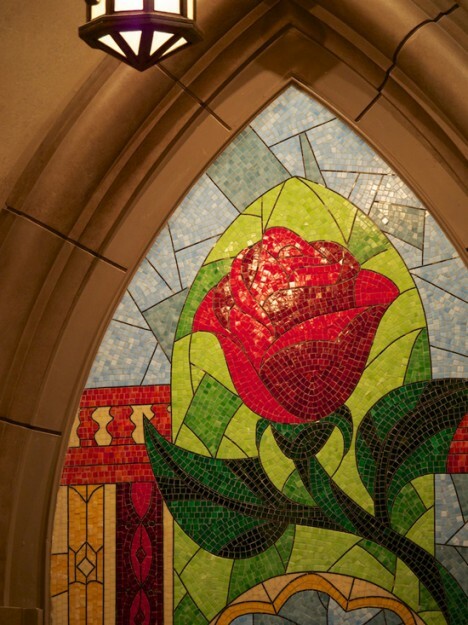 Click these links to see a Be Our Guest Restaurant Photo Tour, and Photos of Be Our Guest Restaurant’s West Wing and Rose Gallery. 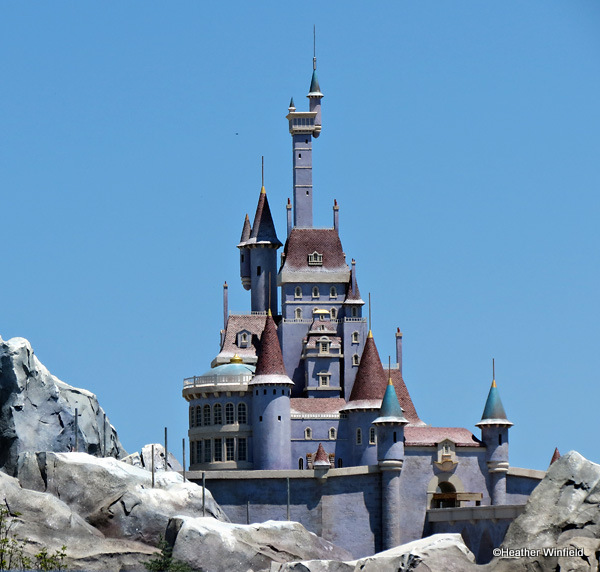 The restaurant is nestled underneath the mysterious castle (home to Beast from “Beauty and the Beast”) in the new Fantasyland “countryside”! Passing through an old gateway to a stone bridge and through wrought-iron gates with six beastly figures along the sides, guests are reminded of the story of the Beast’s transformation. 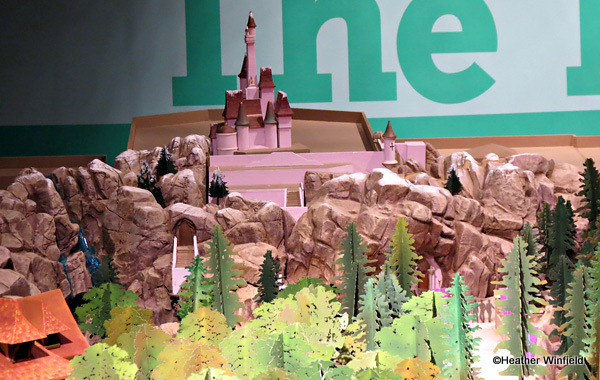 The doors inside the lower rocks (on the right) and between the green trees lead to Be Our Guest. Knock, knock! When arriving for lunch, guests are directed through the Armor Hallway, where six suits of armor stand along the wall (listen closely for an occasional whisper from the metal figures). Wow! In the Beast’s Parlor, lunch orders are placed at five guest-activated terminals (for those who have not participated in the pre-order process). 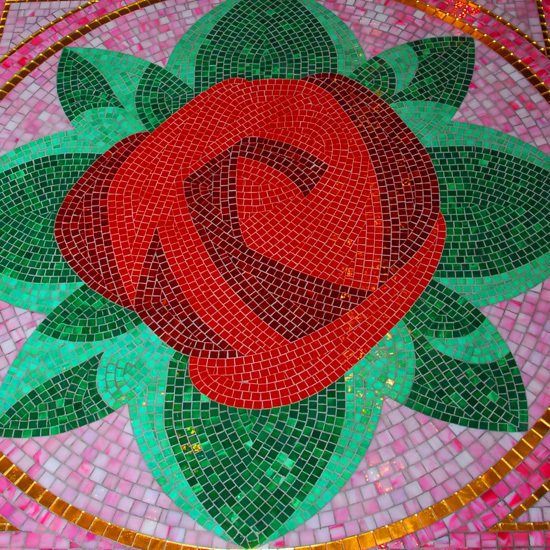 …to these gorgeous entryway mosaics, even the floor is tiled with intricate mosaics! 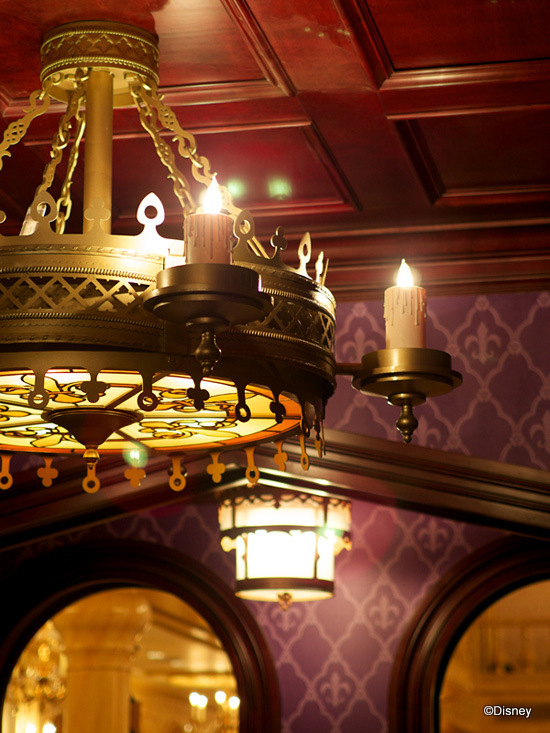 With imagineered details, guests will feel as if they’ve been transported inside the beloved film. Check out a video of the massive mural that serves as the ballroom’s backdrop! 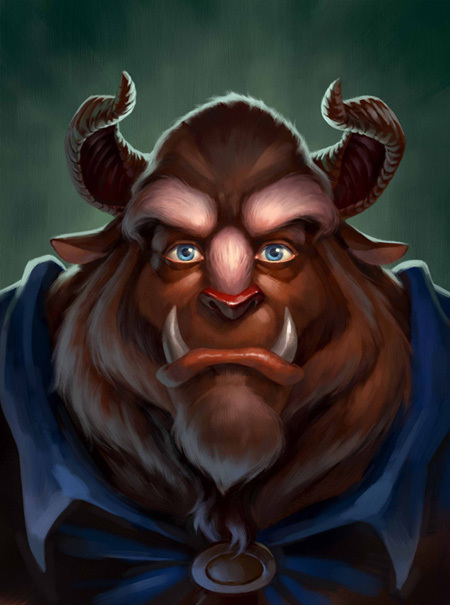 Guests will be enchanted with original artwork and theme elements like this incredible portraitof the Beast himself. 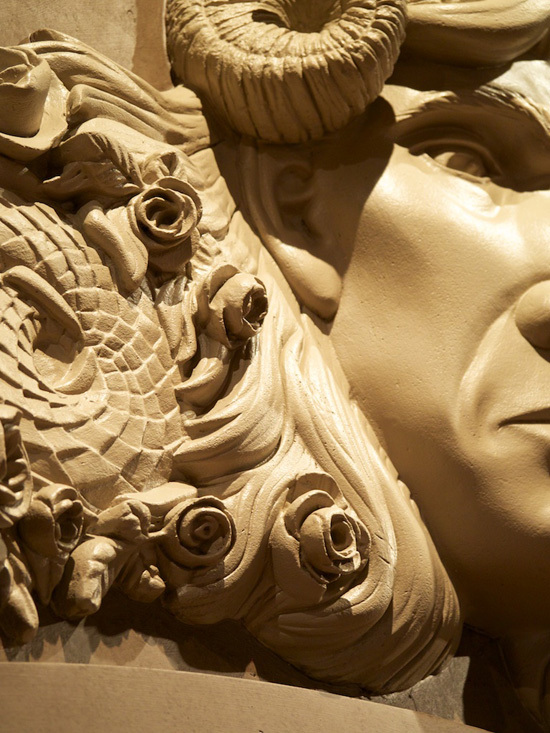 We love this decor motif — the enchanted rosefrom Beauty and the Beast! 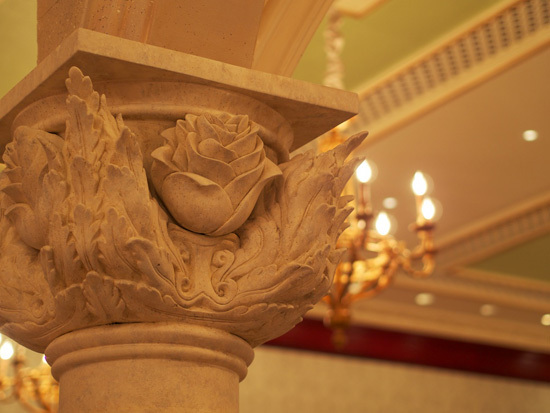 Any fan of the film knows that the symbol of the rose plays a significant role in the telling of Beast’s story. 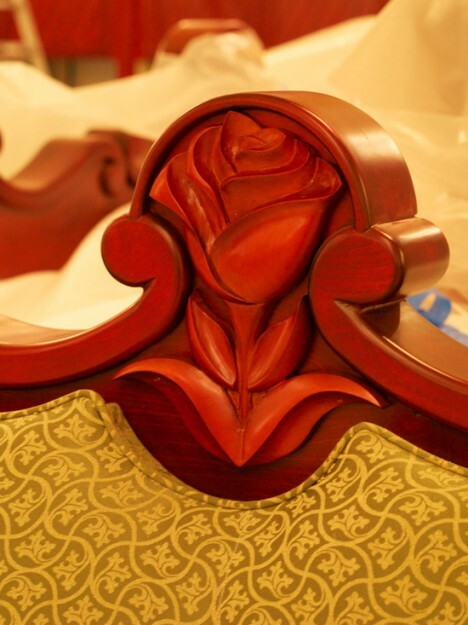 When you arrive for the first time, take note of the roses carved into the backs of restaurant chairs. 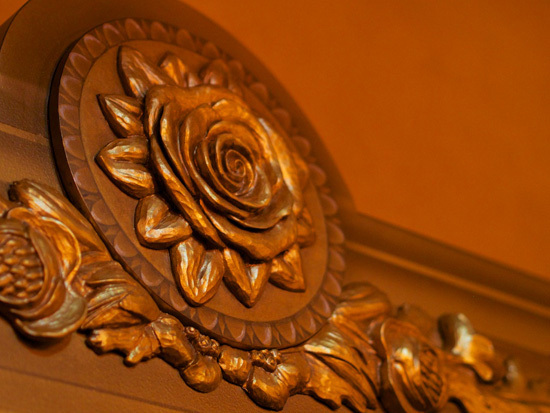 Gilded roses add to the motif. And be sure to look up when passing through the restaurant to take in the rich detail of the ceiling, as well as the roses on the capitals of these pillars. 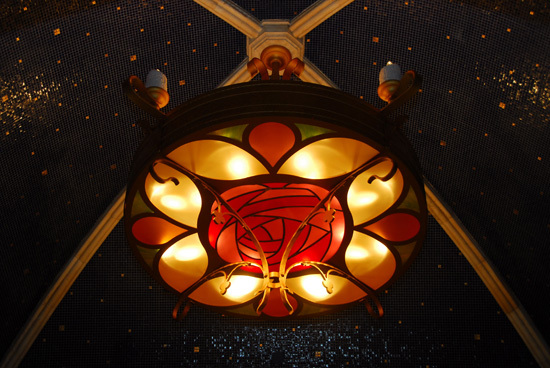 This stunning stained-glass rose chandelier resembles cathedral windows! The stocky candles that flank the middle panel really convey the feeling that you’re in a castle. And check out that gorgeous blue and gold mosaic domed ceiling! 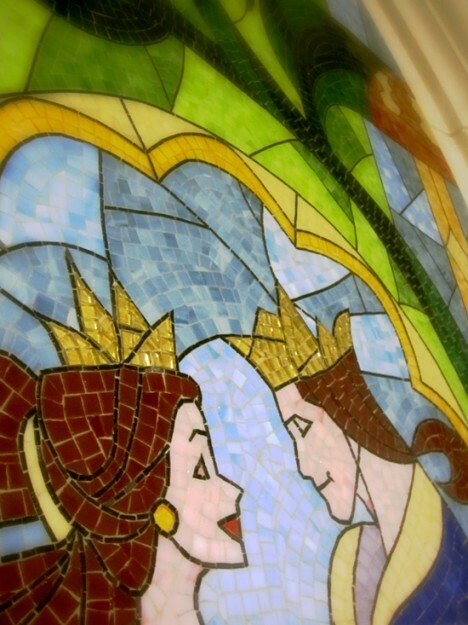 As in all Disney films, music is an important element throughout the Be Our Guest restaurant. Musical themes from the film add to the ambiance. In the Ballroom, a 50-piece orchestra recorded the music from the film. 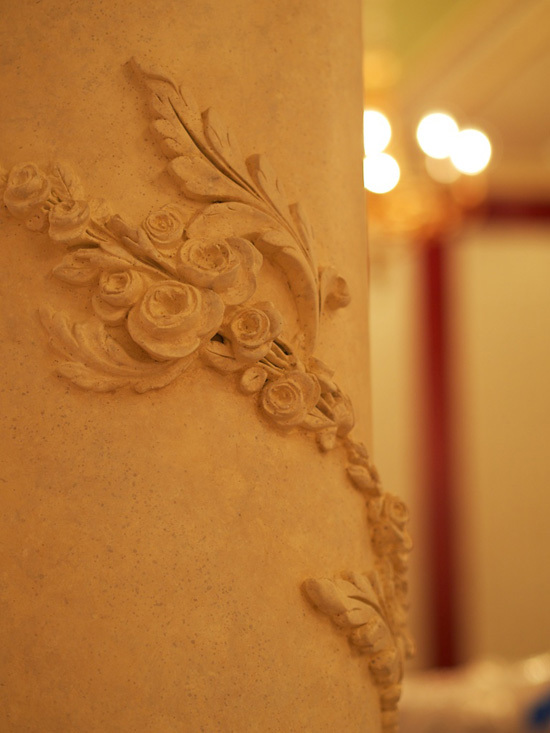 The Rose Gallery, features special music box arrangements of the same pieces heard in the Ballroom, in perfect synchrony, so that guests moving from room to room will hear the same tune transformed from one style to another. It’s in the West Wing, that a somber, melancholy arrangement will be heard. Disney Food Blog Review: Lunch at Be Our Guest Restaurant in Disney World’s Magic Kingdom! Reservations are very difficult to get. You’ll need to call 180 days in advance for reservations or reserve online. If staying at a Disney resort, call 180 days in advance and ask for availability during all days of your stay. Though Breakfast and Lunch and both considered Counter Service meals, they accept Advance Dining Reservations (which, due to popularity, are highly encouraged).